LONDON/ABU DHABI, June 5 (Reuters) – A decision by the Arab world’s strongest powers to break off diplomatic ties with Qatar is already hitting food imports into the small Gulf state with reports that Qataris are beginning to stockpile supplies, trade sources say. Saudi Arabia, Egypt, United Arab Emirates and Bahrain cut relations with Qatar on Monday over alleged support for Islamists and Iran in a coordinated move. Yemen, Libya’s eastern-based government and the Maldives joined in later – opening up one of the worst rifts in years. Qatar, which has a population of 2.5 million people, is largely dependent on imports of foodstuffs to meet its needs. Trade sources, who declined to be named, said the UAE and Saudi Arabia had stopped exports of white sugar to Qatar. Qatar is dependent on the UAE and Saudi Arabia for its white sugar imports, which are estimated at less than 100,000 tonnes annually. Consumption is traditionally higher during the Muslim holy month of Ramadan, which is currently being observed. “Supplies of sugar have been stopped and there is no indication when they could resume,” one Middle East based trade source said. Qatar’s cabinet said earlier on Monday it was still open for trade. “The Council would like to reassure Qatar’s citizens and residents that the government had already taken the necessary measures and precautions to ensure that normal life continues, and that there will be no negative impact caused by the latest measures,” the Qatari government said in a statement. There were already signs of emerging difficulties. Two Middle East trade sources pointed to thousands of trucks, carrying food supplies, stuck at the border with Saudi Arabia which were unable to cross over into Qatar. Trade sources pointed to the likelihood of food shortages growing until there was a resolution of the crisis. About 80 percent of Qatar’s food requirements are sourced via bigger Gulf Arab neighbours, such as the UAE and Saudi Arabia. Saudi Arabia’s Ports Authority notified shipping agents on Monday not to receive vessels carrying Qatari flags or ships that are owned by Qatari companies or individuals. The move followed a similar step by the UAE port of Fujairah, which issued a notice barring all vessels carrying Qatari flags and any destined for or arriving from Qatari ports. The world’s no. 1 container shipping line Maersk said on Monday it was still open for business to and from Qatar, adding that it was following developments closely. Qatar has denounced its diplomatic isolation as based on lies about it supporting militants. It has often been accused of being a funding source for Islamists, as has Saudi Arabia. Iran, long at odds with Saudi Arabia and a behind-the-scenes target of the move, blamed U.S. President Donald Trump’s visit last month to Riyadh. Trade sources said it was possible that Qatar could look at other sources of food from Asia and also Iran if the diplomatic crisis was not resolved. Reza Nourani, chairman of Iran’s Union of Exporters of Agricultural Products, was quoted by the semi-official Fars news agency as saying that Tehran could export food to Qatar by sea, which could reach the country in 12 hours. “We can export any kind of agricultural products and food from Iranian ports of Bandar Abbas, Bandar Lengeh and Bushehr,” Nourani told Fars, which is believed to be affiliated to Iran’s hardline Revolutionary Guards. DUBAI — Four Arab nations led a diplomatic break with Qatar on Monday, moving swiftly to isolate the small but influential country in a feud that stunned the Middle East and divided a coalition of monarchies that the United States had hoped to rally to fight the Islamic State and counter Iran.The countries — Gulf Cooperation Council members Saudi Arabia, the United Arab Emirates and Bahrain, along with Egypt — released coordinated statements accusing Qatar of supporting terrorist groups and saying that as a result they were cutting links to the country by land, sea and air. Other countries, including Yemen, later joined the four-nation bloc in severing ties with Qatar, which hosts a forward base for the U.S. military’s Central Command and is home to the widely watched Al Jazeera television network.The feud, the most serious in decades among the Persian Gulf monarchies, has been simmering for years as Qatar has sought to project its influence across the region, including backing the Muslim Brotherhood and Islamist fighters in Libya and Syria. But the flaring tensions raised fears of another destabilizing conflict in a region already grappling with three civil wars and jihadist insurgencies on several fronts.The diplomatic break also complicated U.S. efforts to rally Arab and Muslim leaders to form a united front against Sunni extremists and Iranian influence. That had been the principal reason for President Trump’s visit to Riyadh, the Saudi capital, last month, a trip that the president and his allies had hailed as a success. But observers in the Middle East warned that the trip also amounted to a tacit endorsement of Saudi Arabia’s frequently domineering and sharply contested leadership in the Middle East and was likely to aggravate local rivalries and disputes. Saudi Arabia is often accused of indirectly fueling militant views through its rigid Wahhabi brand of Islam. The Indian Ocean nation of Maldives also joined the break with Qatar. But two other Persian Gulf states, Kuwait and Oman, which have frequently played mediating roles in Arab disputes, did not announce any measures against Qatar. Secretary of State Rex Tillerson and Defense Secretary Jim Mattis, traveling in Australia on Monday, said the feud would not affect the U.S.-led coalition fighting Sunni extremist groups in the Middle East. The United States uses bases in several of the countries to launch air operations against the Islamic State group. The U.S. headquarters for the air war is at the Al Udeid Air Base in Qatar. “What we’re witnessing is a growing list of irritants in the region that have been there for some time, and obviously they have now bubbled up to a level that countries decided they needed to take action in an effort to have those differences addressed,” Tillerson said. Other nations with strategic ties in the region, including Turkey and Russia, quickly urged efforts to keep the diplomatic spat from widening. 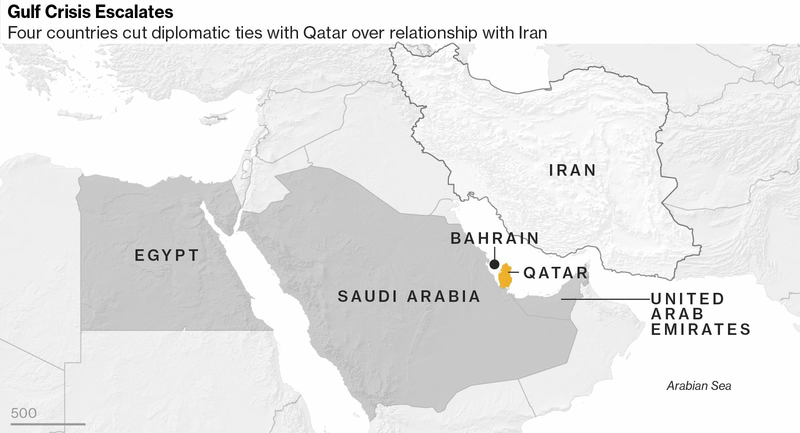 While the other Persian Gulf states have expressed anger over Qatar’s ties to Iran, with which it shares a massive oil field, others in the region also maintain strong economic relations with Tehran. The UAE is Iran’s biggest non-oil trading partner, and Oman conducts an open dialogue with the government there. Far deeper is the dispute over Qatari support for political Islam, in particular the Muslim Brotherhood. In its early days, the Trump administration prepared an executive order designating the Brotherhood as a terrorist organization, only to pull back after a number of Arab leaders, including Jordan’s King Abdullah II, advised against it. Egypt and Saudi Arabia have long pushed for Qatar to expel Brotherhood figures, as well as members of the Palestinian militant group Hamas, who live there. Qatar has also drawn the ire of Arab neighbors for its sponsorship of the Al Jazeera television channel, which hosts frank discussions of politics in the region while amplifying Qatar’s ­pro-Islamist views. And Qatar is among several gulf countries, including Kuwait, Bahrain and Saudi Arabia, accused in recent years of looking the other way as their citizens privately sent money to Islamist militants abroad, including in Syria. The statements by the Arab countries Monday, however, went far beyond the usual criticism of Qatar for supporting Sunni extremists, accusing it of interference in conflicts from Yemen to the Sinai Peninsula. The first signs of the intensifying feud emerged soon after Trump’s visit to Saudi Arabia. In the days that followed, the Saudi government and its allies attacked Qatar for statements allegedly made by its emir that were sympathetic to Iran and militant groups such as Hezbollah and Hamas. Qatar later said that the statements, which were posted on the state news agency’s website, were fake and that the agency’s site had been hacked. That explanation, however, did not stop the attacks on Qatar from media outlets loyal to the Saudi or Emirati government. It remained unclear what exactly led the Arab states to move so suddenly and forcefully to isolate Qatar. Young and others suggested that the timing of the move might be related to the upcoming release of an FBI report on the alleged Qatari hacking. The Qatari government had invited the bureau to assist in an investigation of the incident. And last month, a Washington-based think tank, the Foundation for Defense of Democracies, which has been supportive of the Emirates and at the forefront of efforts to cancel the Iran nuclear deal, held a day-long meeting in which a series of speakers were sharply critical of Qatar. The keynote speaker was former defense secretary Robert M. Gates, who described Qatar as a strategic U.S. ally but expressed concern over its apparent support for groups that the United States considers terrorists. For Qatar, a peninsula nation that shares its only land border with Saudi Arabia, the effects of the partial blockade could be catastrophic, as airlines in the four Arab countries announced that they were halting flights and as residents flocked to supermarkets to hoard supplies. There was also growing uncertainty among the large community of Egyptian expatriates who had fled Egypt’s dismal economy and found work in Qatar. Estimates of the number of Egyptian workers in Qatar range from 180,000 to 300,000. Rania Dorrah, a 38-year-old Egyptian interior designer, said she and her husband were concerned that they would not be able to renew their work visas because of the crisis. Her husband, an accountant, tried to renew his visa Monday but was told to come back later, “because everything has been halted for now,” she said. Dan Lamothe in Sydney, Heba Farouk Mahfouz in Cairo, and Brian Murphy and Anne Gearan in Washington contributed to this report. Qatar is a small country with a big war chest. The Gulf nation has landed at the center of a major diplomatic crisis after Saudi Arabia, Bahrain, Egypt, Yemen and the United Arab Emirates broke off diplomatic relations on Monday. Stocks dropped over 7% in Doha on Monday as investors fretted over the spat. But Qatar itself is backed by a portfolio that spans everything from stakes in Volkswagen (VLKAF) to Tiffany & Co (TIF). The country’s $335 billion sovereign wealth fund has invested more than $30 billion in stocks and billions more in other assets. The fund, called The Qatar Investment Authority, was founded in 2005 to grow the money made off the OPEC nation’s natural resources. In August, the sovereign wealth fund put $622 million toward a stake in Empire State Realty Trust (ESRT), which owns and operates the Empire State Building and other prime New York properties. The fund also owns 8.3% of Brookfield Property, which has prime real estate holdings across the world. The country and its royal family own a string of trophy assets in London, including the Harrods department store, the Olympic Village and the Shard — western Europe’s tallest building. It also owns parts of the city’s financial district. Qatar’s sovereign wealth fund was part of a group of investors that bought a 61% stake in the U.K.’s gas pipe network from National Grid. In December, Qatar teamed up with commodities group Glencore (GLCNF) to buy a 19.5% stake in Russian oil giant Rosneft. It also owns a 4.6% stake in Royal Dutch Shell (RDSA). Qatar’s state fund is the third biggest investor in Volkswagen (VLKAF) after the Porsche family and the German state of Lower Saxony. It owns $9 billion stake in the automaker. The fund holds a 13% stake in Tiffany Co (TIF) that is valued at $1.4 billion. It also owns 9% of Glencore and 21% of Siemens (SIEGY). Qatar was rewarded with a 6% stake in Barclays after coming to its rescue during the global financial crisis. It owns 8% of Credit Suisse (CS). Saudi Arabia and three of its Arab allies cut diplomatic ties with Qatar on Monday, furious with what they see as the tiny emirate’s tolerant attitude toward Iran and Islamist groups such as the Muslim Brotherhood. The moves by the Saudis, Bahrain, the U.A.E. and Egypt came soon after U.S. President Donald Trump visited the region and joined Saudi Arabia in lambasting Iran for sponsoring terrorism from Syria to Yemen. 1. What’s caused the diplomatic rift? It’s mostly, but not all, about Iran. The spark for this flare-up was a report by the state-run Qatar News Agency that carried comments by Qatar ruler Sheikh Tamim bin Hamad Al Thani criticizing mounting anti-Iran sentiment. Qatari officials quickly deleted the comments, blamed them on hackers and appealed for calm. Criticism by Saudi and U.A.E. media outlets escalated after Sheikh Tamim phoned Iranian President Hassan Rouhani over the weekend in apparent defiance of Saudi criticism. 2. So this is a Sunni vs Shiite tension? cited Qatar’s support of “terrorist groups aiming to destabilize the region,” including the Muslim Brotherhood, Islamic State and al-Qaeda. 3. Why is the spat taking place now? The temperature noticeably rose following Trump’s visit. Days after Trump and Saudi King Salman bin Abdulaziz singled out Iran as the world’s main sponsor of terrorism, Saudi Arabia and the U.A.E. accused Qatar of trying to undermine efforts to isolate the Islamic Republic. Newspapers, clerics and even celebrities attacked Qatar’s Sheikh Tamim; the Riyadh-based Al-Jazirah daily declared that he stabbed his neighbors with Iran’s dagger. 4. What do analysts say? Emboldened by closer U.S. ties under Trump, the Saudis and the U.A.E. are seeking to crush any opposition that could weaken a united front against Iranian influence in the Middle East. The two countries are also putting pressure on Qatar to end its support for Islamist movements such as the Muslim Brotherhood and the Palestinian Hamas group that rules the Gaza Strip. 5. What does Iran say? Before the latest confrontation, Rouhani, a moderate cleric who was re-elected to a second, four-year term last month, said his country is ready for talks to end the feuding. At the same time, though, Iran’s Supreme Leader Ayatollah Ali Khamenei, who wields more power than Rouhani, has said the Saudi regime faces certain demise for its policies in Yemen. In 2015, Saudi Arabia assembled a coalition of Sunni-led countries to fight Yemeni Shiite rebels loyal to Iran after they toppled a Gulf-backed government. The war there continues. 6. Where else are Saudi and Iran facing off? They are locked in proxy wars on opposite sides of conflicts across the region from Syria to Yemen. Suspicions that cyberattacks on government agencies in Saudi Arabia emanated from Iran threatened to elevate tensions between the two powers in late 2016. Earlier that year, after Saudi Arabia executed a prominent Shiite cleric, Iranian protesters set the Saudi embassy in Tehran on fire, and Saudi Arabia severed diplomatic relations with Iran. 7. Are disagreements with Qatar anything new? In 2014, Saudi Arabia, the U.A.E. and Bahrain temporarily withdrew their ambassadors from Qatar. That dispute centered on Egypt, where Qatar had supported a Muslim Brotherhood government while the Saudis and U.A.E. bankrolled its army-led overthrow. Qatar also hosts Hamas’s exiled leadership as well as Taliban officials. Analysts say Saudi and its allies want to show Qatar, a country of 2.6 million residents, that it is punching above its strategic weight. 8. Isn’t that what Qatar tries to do? Less so now than in the past. During the Arab Spring uprisings Qatar, uniquely among Middle Eastern governments, broadly supported groups agitating for change — as long as it was outside the Persian Gulf. Muslim Brotherhood groups have mostly foundered since, and Qatar reeled back its support for them in 2014 when faced with diplomatic threats from its Gulf neighbors. Qatar also aspires to be the region’s indispensable mediator. Its leaders have connections with a wide range of parties, such as warring tribes in Libya as well as both the U.S. and the Taliban. On the other hand, by choosing sides during the Arab Spring revolts, it weakened its standing as a neutral party. 9. What else is Qatar known for? It’s the world’s biggest exporter of liquefied natural gas, has the world’s highest per-capita income ($129,700 a year), will hold the 2022 FIFA World Cup and hosts the Al Jazeera television channel. When Saudi Arabia ejected the U.S. air operations center for the region in 2003, Qatar took it on. Today the emirate hosts 10,000 U.S. troops and is home to the forward headquarters of CENTCOM, the U.S. military’s central command in the Middle East. The nation’s $335 billion sovereign wealth fund holds stakes in companies from Barclays Plc to Credit Suisse Group. 10. What are the repercussions for markets? Any dispute in the region will make oil markets nervous. Internal disputes among the Gulf countries could limit their appeal to foreign investors. Even before Trump’s visit, Citigroup said rising tensions between the U.S. and Iran could also have “significant”’ implications for oil and financial markets. Qatar stocks plunged 7.3 percent by the market close on Monday and dollar bonds tumbled, with yields on bonds due in 2026 increasing 23 basis points. Oil erased earlier gains, however, because the diplomatic clash was seen as having limited impact on OPEC policy. 11. Why might this dispute be different? “Internal differences and disagreements are nothing new, but what is interesting is the timing and the somewhat unprecedented level of pressure,” says Mehran Kamrava, director of the Center for International and Regional Studies at Georgetown University in Qatar, referring to the recent Trump visit. That suggests that “Saudi Arabia and the U.A.E. want nothing but complete submission from Qatar.’’ If Qatar resists, that will further destabilize an already volatile region. For one, the faceoff also encumbers U.S. efforts to fight Islamic State: Qatar is home to bases central to the U.S.-led air offensive. ‘Qatar wants to give Kuwait’s Sheikh Sabah Al-Ahmad Al-Jaber al-Sabah the ability to “proceed and communicate with the parties to the crisis and to try to contain the issue,” Sheikh Mohammed bin Abdulrahman al-Thani said in comments to Qatar-based Al Jazeera television. ‘Kuwait’s emir had an important role in a previous Gulf rift in 2014 and Qatar’s Sheikh Tamim “regards him as a parent and respects his desire to postpone any speech or step until there is a clearer picture of the crisis,” Al Jazeera quoted the foreign minister as saying. Qatar’s foreign affairs ministry said the measures were unjustified and based on false claims and assumptions. As the Qatari stock market tumbled and oil prices rose, it accused its fellow Gulf states of violating its sovereignty. Egypt’s foreign ministry accused Qatar of taking an “antagonist approach” towards the country and said “all attempts to stop it from supporting terrorist groups failed”. It gave the Qatari ambassador 48 hours to leave Egypt, and ordered its own chargé d’affaires in Qatar to return to Cairo within 48 hours. The tiny island nation of Bahrain blamed its decision on Qatar’s “media incitement, support for armed terrorist activities, and funding linked to Iranian groups to carry out sabotage and spreading chaos in Bahrain”.